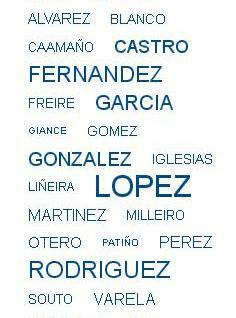 The objective of the dictionary of Galician surnames is to give pertinent etymological, geographical and historical information about each surname. It consists of about seven thousand entries (between main headwords and secondary entries), in alphabetical order and selected mainly on the basis of frequency, with the inclusion of names with over thirty occurrences and those with fewer occurrences but which are variants of other headwords. The data come from the 2001 census of the Instituto Nacional de Estadística (Madrid). The standardized forms are chosen from among existing forms based on the criteria published in Bulletin 370 (2009) of the Real Academia Galega. Each entry gives the number of occurrences of each form, etymological information, historical documentation (the date of the oldest known attestation) and, where pertinent, information about present-day geographical spread, relation to a corresponding toponym, and a map representation.